This might be the one time when it really doesn’t matter which line you’re in at the airport, none of them are moving. Costa Rica’s Juan Santamaría International Airport was choked with lines of passengers on their way in and out of the country Friday as the Immigration Administration reportedly implemented stricter passport controls following news that a Syrian woman entered Costa Rica with a fake Greek passport Tuesday. The movement of Syrians has come under additional scrutiny following the Paris attacks launched by Syria-linked jihadists. 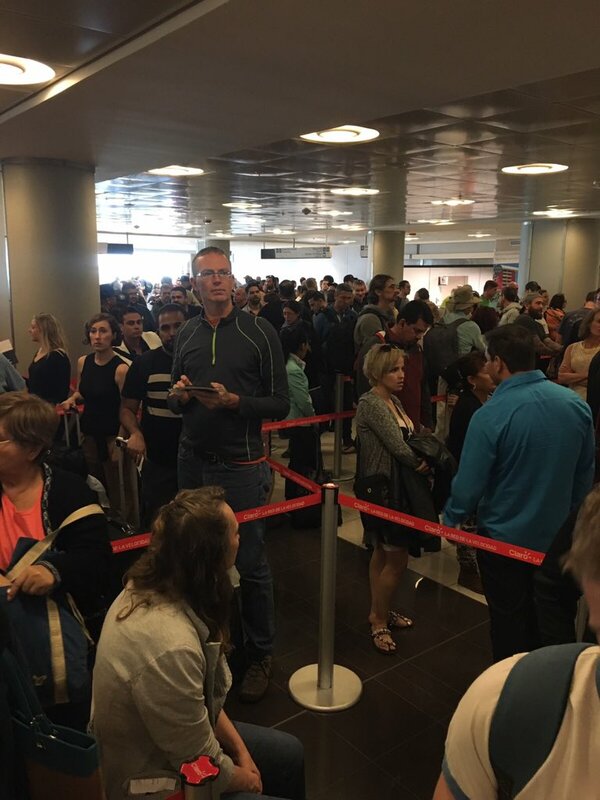 Exasperated tourists waited in lines for hours Friday after authorities required all travelers to have their passports checked twice regardless if they were entering or leaving the country. Both the name and the passport number of travelers was being checked. Immigration Administration Director Kathya Rodríguez told the radio program Nuestra Voz Friday that she had ordered airports and land ports of entry to double down on enforcement “even though it takes more time,” news website AmeliaRueda.com reported. The website reported Friday afternoon that some travelers waited up to four hours passing through the tightened controls at the airport. There are no plans to hire additional staff, Immigration Administration spokeswoman Andrea Quesada told the daily La Nación. But customs officers will receive additional training, Quesada said. In addition to the Syrian woman arrested in Costa Rica on Thursday, five Syrians traveling with falsified Greek passports were arrested in Honduras on Wednesday.